An effective and very popular way to treat the deep lines caused by muscle actions, such as the “frown lines” in the forehead, “crow’s feet” lines around the eyes, and some of the lines around the lower mouth and chin. It is designed to temporarily weaken the muscles that cause these deep lines by injecting a very weak dose of toxin. Afterwards, facial muscle function still exists (you can still frown), but the skin does not wrinkle as deeply as before. BOTOX® lasts for about four to six months, and may be repeated when necessary. BOTOX® side effects are minimal, but may include bruising, mild headache for a day, and rare allergic reactions. First doses are done according to manufacturer recommendations and subsequent dosing is modified by results of the first injection (i.e., more or less units per injections). Very rarely, it can affect muscle away from the injection site, and may be serious. Patients with neuromuscular disorders, my asthenia gravis, and egg allergies should not use these products. Similar products include Dysport® (abobotulinumtoxinA) and XEOMIN® (incobotulinumtoxinA). Dosing and effects are similar, but , Dysport® according to some may last slightly longer and work slightly faster. It diffuses more widely than BOTOX®, and at least in theory, may diffuse into muscles that should not be treated, such as eye muscles. XEOMIN® is marketed as having similar effects and efficacy as BOTOX®. It has very recently been approved by the FDA for cosmetic treatment of glabellar lines. XEOMIN® claims some price and storage (not refrigerated) advantages, but I have little experience with it at this time. Because of my familiarity with BOTOX®, and a negotiated pricing with the company, that we can pass on to you, at this time we are using BOTOX® a majority of the time. This is an older injection treatment option designed to fill in deep lines in the face, particularly around the mouth. It is rarely used anymore, and has been replaced by more efficient and longer lasting fillers. Hyaluronic Acid is a substance widely found in the connective tissues in the body, including joint fluids. It is manufactured by forcing bacteria to secrete it, which is similar to the way many antibiotics are manufactured today. It was approved by the FDA in 2003 for the treatment of facial wrinkles and is sold under various brands such as Juvederm®, Restylane®, and Perlane®. It is injected into the base of the wrinkle, elevating the “valley” making wrinkles less deep and less obvious. It lasts about six months. Side effects may include bruising and small excess bumps, which can often be massaged out. Excessive injections can be dissolved with hyaluronidase, an injectable enzyme. Hyaluronic acid injections are also useful for treatment of depressed scars, such as acne or chickenpox. Because of pricing arrangements with the manufacturer, we use mostly Juvederm® and have been very happy with its results. Artecoll®, was approved by the FDA for treatment of naso-labial folds (the lines from the corner of the nose to the corners of the mouth). It is mostly collagen combined with plastic beads (3.5 micrometer size). It’s effects are long lasting, but it has potential to cause granulomas, which are small scar “balls” under the skin, which can be felt and would also be long lasting. More research on Artecoll®, is needed. 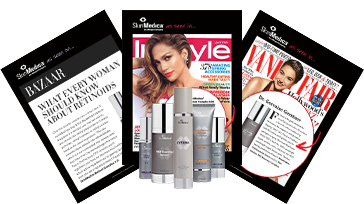 We now carry SkinMedica Products! Call to find out more! Dr. Leland Chick is proud to offer a range of surgical and non-surgical cosmetic enhancement procedures to help men and women throughout Utah look and feel their best. As a top Salt Lake City plastic surgeon, he is well-known as a leading provider of Botox, eyelid surgery, rhinoplasty and facelift surgery. To learn more or to schedule a consultation, contact Dr. Chick today by calling 801-322-1188.